Bryan O'Malley presents his poster at the GoMOSES Tuesday evening poster session. NEW ORLEANS, LA – An impact index of the ecological health of a body of water known as the AZTI Marine Biotic Index, or AMBI, is commonly used in Europe where it is legally required to define the index for each body of water. 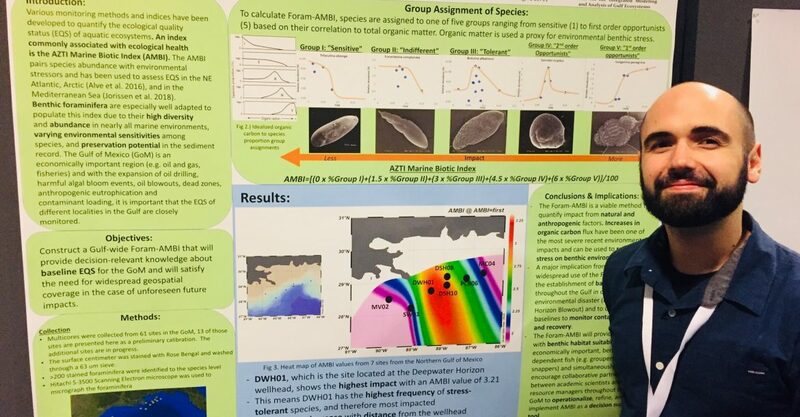 Bryan O’Malley, a Master’s student at USFCMS and a collaborator of C-IMAGE, has examined sediment samples from over 100 sites in the Gulf of Mexico to determine total species abundance of foraminifera, tiny shelled organisms that serves as great ecological indicators. Using characteristic graphs of the ratio of species population percentage to concentration of organic matter in the sediment, as described by the AMBI method, O’Malley found that the sediment sites around the Deepwater Horizon (DWH) blowout returned an AMBI score of 5, meaning that the foraminifera population reflects an environment that has been greatly impacted. Other studies have shown a recovery of the diversity and density (number of shells found in the sediment) of foraminifera after the DWH blowout, but as those studies have cautioned and O’Malley’s AMBI analysis confirms, a recovery of diversity and density does not necessarily mean that the original community has returned. Essentially, many individuals of opportunistic species have filled the void – the community is not who it used to be. O’Malley hopes to see the same ecological quality standards used in the U.S. that are used in Europe. More on maternal transfer of PAH’s: species specific? This website is maintained by USF College of Marine Science.